The eventful Pilgrimage comes to an end. In due time Subhadra delivers a boy, Abhimanyu. Krishna becomes very fond of his nephew and the parents dote on him. Similarly Draupadi has five valiant children from the five Pandavas. Pandavas continue to rule with dharma from Indraprastha and people are content. One day Arjuna feeling hot suggests a day's outing with their near and dears on the banks of Yamuna to beat the heat. They locate a nice picnic spot and enjoy themselves. There is plenty of food, drinks, laughter and also music. Krishna and Arjuna relax a little away from this group and have an enjoyable chat. A brahmin approaches them. He is tall, golden in color and radiant. Krishna and Arjuna greet him with due respect. He addresses them: 'Sirs, I have a big stomach and you must help me to fill it.' They respond with: 'Tell us the food you like to eat, we will try to provide it'. He replies: 'I do not eat like others! 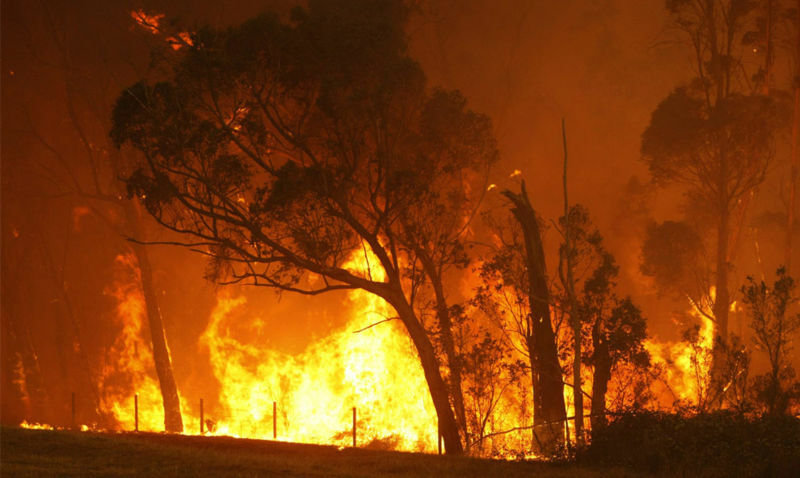 I am Agni, it is my desire to consume this Khandava forest, but Indra is protecting it and whenever there is a fire he douses it with heavy rains. It is because his friend Takshaka and his family live here and due to this a number of animals and birds also have found shelter. 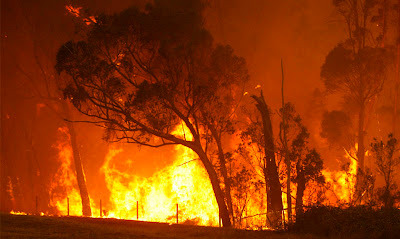 If you kindly help I can burn this forest'. Agni thinks of Varuna and he comes and at Agni's behest, gives Arjuna the great bow Gandhiva, an inexhaustible quiver with a never-ending supply of arrows, a shining chariot with splendid horses and a flag with Lord Hanuman seated in it. Srikrishna is given the powerful Sudharshana chakra. This chakra returns to the one who wields it after killing anyone intended, a raskshasa, a deva, a pisaacha or whoever. In addition he is given the mace Kaumodaki. Armed thus they are ready to face anyone, even Indra! 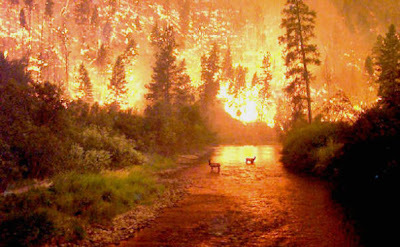 The fire spreads in the forest. Arjuna and Krishna guard either side of the fire and do not allow even a single animal to escape. Thousands of birds and animals die screeching and howling in pain. Some are half burnt and their eyes pop bursting and a few jump only to land back into the fire. Babies and mothers cling to each other in pain and fear and die as they are unable to get free from each other. The lakes boil and thousands of fish and turtles are cooked and go belly up and float. Fire dances all over in abandon. Indra sends down heavy rain with clouds full of fiecre thunder. Arjuna creates a canopy over the forest shooting arrows in such a speed that not a drop of water falls on the fire. Finally agni is satisfied. Takshaka manages to escape, So do his son Ashwasena, Maya a rakshasa and just four birds. Even Indra himself with the help of devas cannot not stop Arjuna. Indra pleased with his son offers him a boon. Arjuna desires some Astras. Indra agrees and promises to give it to him at the time when Mahadeva is pleased with Arjuna. The final chapter of Adiparva is astonishing. It begins happily with an account Subhadra and Draupadi delivering children and the one day family picnic. I have counted a total of nine Pandava offspring so far including these! And ends with a disastrous forest fire. 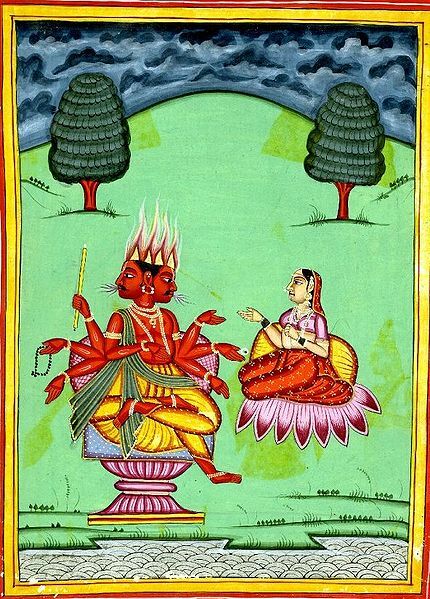 The fire during Mahabharata times could be classified as due to heavenly causes. Of course nurtured and helped by Krishna and Arjuna. I wondered how Agni actually started a fire. The picture gives us an idea. Courtsey: wikipedia. Kamala says Agni assumed the form of flames. While today most forest fires are man-made, there still are a few which are due to natural causes. We can ascribe it to gods, if due to lightening it is Indra, to dry weather it would be Surya and if indeed it is due to earthquake and the volcanic flow, probably our mother earth is angry. The episode had a purpose; of transferring the Astras used by devas in their earlier wars to Arjuna and Krishna, the story would also have had a salutary effect on the people who heard it. The only way of warning people those days about forest fires and its colossal effect on their lives.